We all do it. We're driving around, and we see, say a Facel-Vega and we think: "Typical. I bet that's another licorice-chewing, harp-playing Dutchman in a Facel-Vega," and sometimes we're right. 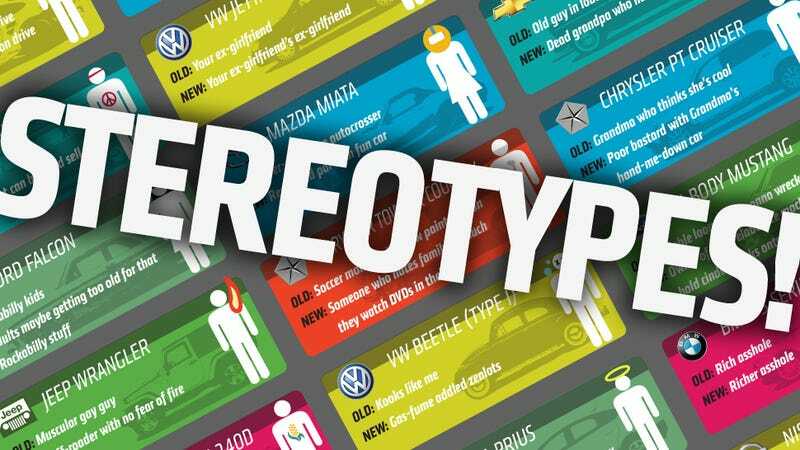 There are stereotypes for so many types of car owners that come up again and again, so we thought we should make a chart. Now, we didn't want to just make a chart of common stereotypes – lots of them are getting pretty stale, and some are just offensive for no good reason. So we decided to see about updating them to make a bit more sense for our shiny, modern world. So, here's your chart of revised stereotypes you can try out! I'm not saying all are perfect, and we certainly didn't get them all, but it's a start. I'm pretty sure you'll have some ideas on this, so, you know, have at it.